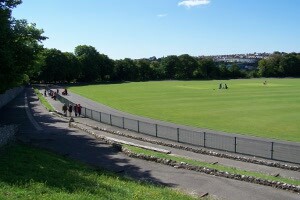 Preston Park Velodrome is the oldest cycle track in the country. 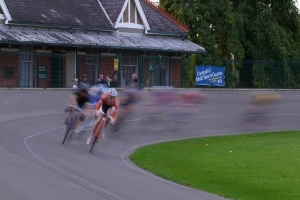 Situated in the north east corner of Preston Park, it offers cyclists a unique track racing experience. We offer hire on an hourly or seasonal basis. It is the ideal venue for cycle clubs and youth groups to practice and compete. New riders are always given a warm welcome. The league season runs from April to August, providing a great evening's entertainment as either a spectator or participant. Cycling is booked on Saturday mornings, Wednesday and Friday evenings. Click on the map above to find the Velodrome. The historic velodrome at Preston Park reopened for competitive cycling on Sunday 8 May 2016. The velodrome was closed to competitive racing in September 2014 after concerns were raised about the safety of the track perimeter fence. Brighton & Hove City Council and British Cycling worked together to progress the renovations as quickly as possible to meet the needs of local cyclists. Cyclists across the city campaigned and supported the moves to bring the track swiftly back into competitive use. The total cost of the works was £148,000, most of which was funded by a grant award from British Cycling, with the remaining £38,000 coming from section 106 funding contributions from planning applications. The work included replacing the perimeter fencing and gates as well as improvements to the site to bring it up to modern standards. The Velodrome was dug out, by hand, by the British Army in 1877. The track was ready to start racing the following year and was used for annual competitions right up until the start of the First World War. When the track re-opened at the end of the First World War, the track surface was made of cinders, meaning riders who had crashed had to be taken to the club house to have the cinders removed with hot water and a scrubbing brush. The Track's tarmac surface was laid in 1936, with the first and last corners also being raised for safety reasons. During the 1950's, Bank Holiday races would attract up to 10,000 spectators who would watch cycling legends such as Reg Harris take on the Velodrome. Spectators were treated to races that were as fast as they were dangerous. There were first-aiders on every corner and judges would pull fallen cyclists off the track to ensure the races were not delayed. 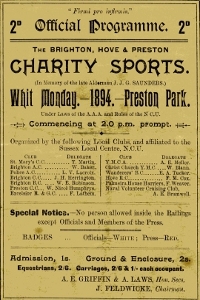 Although the popularity of the track declined in the 1970's and 1980's, a new league was formed in 2000 which has gone from strength to strength. With exciting races taking place every Wednesday evening from April to August, riders of all ages and abilities are invited to take part. The track is free to ride on every day (unless a track meeting or the Cricket pitch have been booked) and spectators are always free. For further League information go to the Sussex Cycle Racing League site. For more information on Velodromes around the country, go to the Velodrome site. 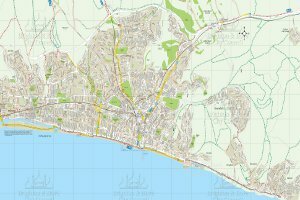 Cycling around Brighton and Hove.